Soon, Nan also began communicating with her son and received messages that were to change her life forever. Sounds came in from the silence-conquering the great divide and proving that there is something far beyond the life we live. Sounds of Silence traces in moving detail her joy at coming in touch with Karl once again, and her gradual introduction to Meher Baba, her son’s guru in the afterlife. In sounds of Silence Nan bares her soul, reflecting her own initial skepticism and doubts, until the weight of the evidence left her in no doubt about the reality of the messages. This is a book that challenges many concepts about life and death, and particularly life after death. Originally self-published, Sounds of Silence fast became an ‘under-ground’ bestseller, and a tremendous source of strength for thousands who were drawn to it. This is a story of a mother’s unrelenting hope, and of a love that never dies. 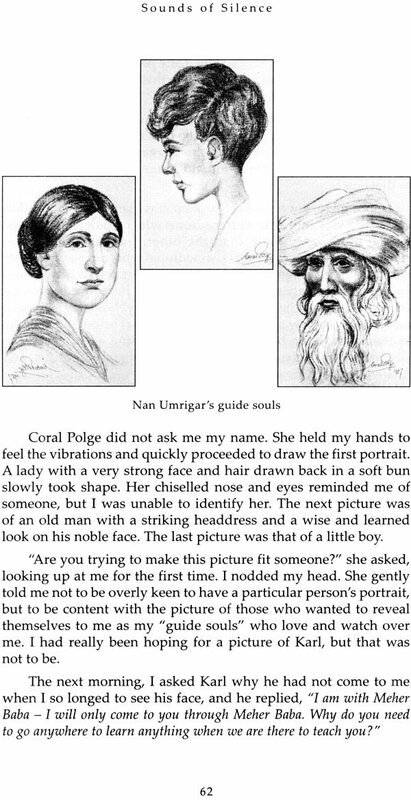 Nan Umrigar’s astonishing and well-illustrated story will certainly open up many minds. It asks many questions and provides some answers that give new insights of life’s greatest mysteries. 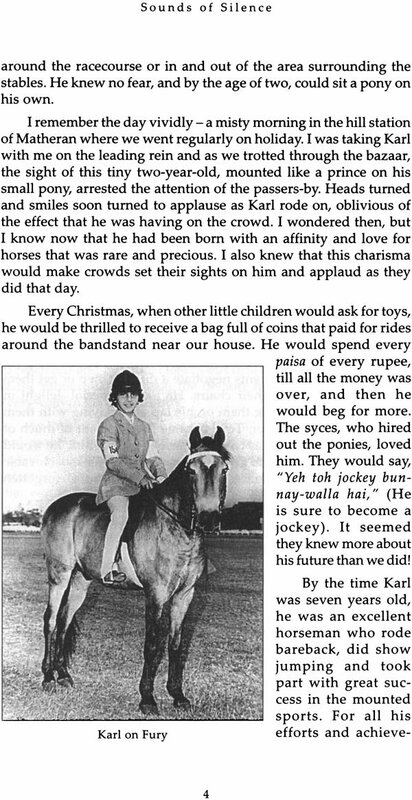 Young Karl Umrigar had only one passion in life-horses and racing. At the age of eighteen, his childhood fantasy came true-he raced to fame. The world was at his feet for he had won every major race of the season, but tragedy struck. 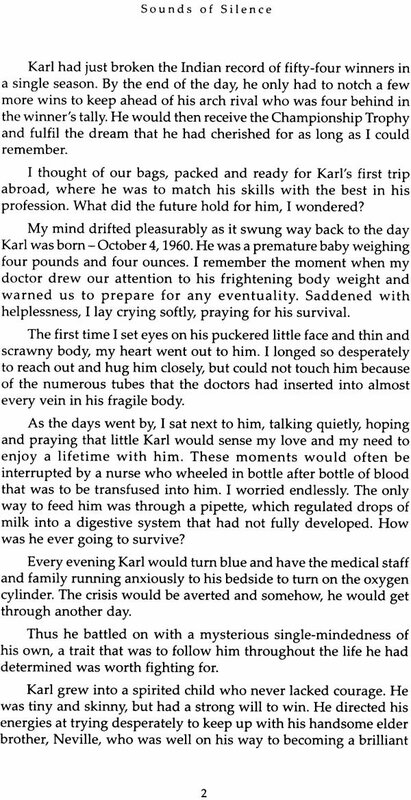 Karl died of an accident on the racetrack. 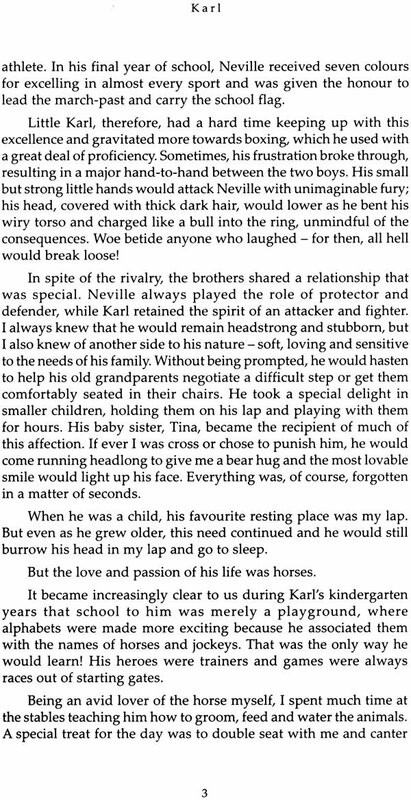 However, this is not a story of his rise to fame or of his tragic end, it is a faithful account of what happened six years later-of Karl’s determination to show his mother the way out of grief, to happiness. The years that followed his death were dark ones for me, but in 1984 something happened which was to change my life forever.It was the day I embarked on my journey into the realms of mysticism and automatic writing. 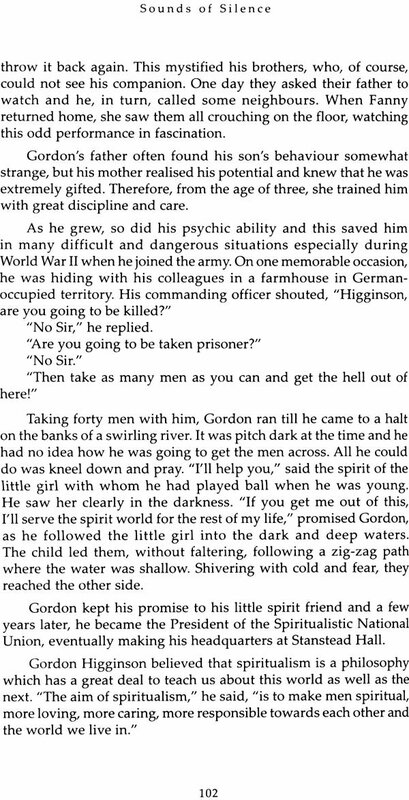 ‘Sounds’ filtered in from the ‘silence’, and I began to converse with an energy-force which I eventually believed to be my son. I was exhilarated but at the same time could not help questioning this phenomenon. Was this fantasy, imagination, or just plain wishful thinking on my part? Was there really a higher energy, a higher consciousness-angels, guides, guardians and a God? 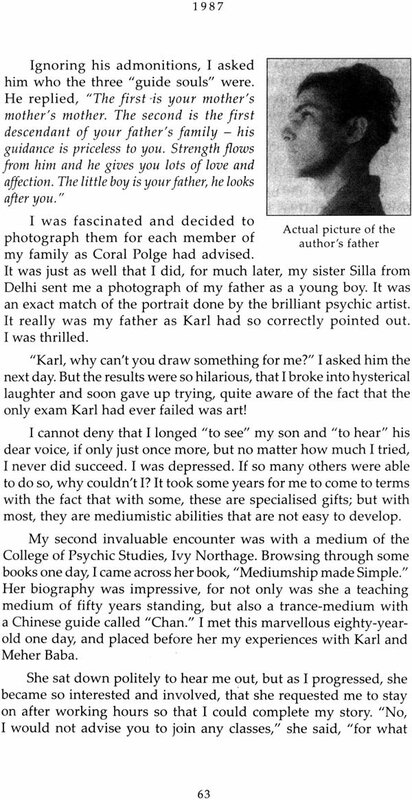 It did not take Karl long to guide me to a place quite alien to my way of being or belief, and to the Samadhi of a man known as Meher Baba and believed to be the ‘Avatar of the Age’. The life of a spiritual Master held no interest for me, but the manner and tenacity with which my “spirit son” led me to Him, intrigued me. To understand what was happening, I sought out and began meeting ‘mediums’ here in India, and abroad, asking questions to which they seemed to have no answers. 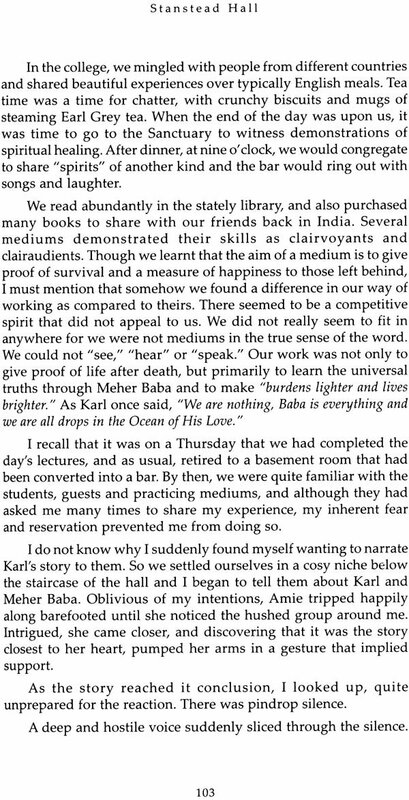 “In the ambit of spiritualism,” Coral Polge said, “there has never been a recorded experience such as yours.” In the effort to explain some of it to those who arrived at my doorstep, to find answers to the connection between Karl and Meher Baba and therefore, between Meher Baba and me, I had to repeat my story over and over again. To Amie Rabadi, the first who rang my doorbell, Karl’s communication was unquestionable. As time went by, not only did she depend on her own instinct and detailed study of Meher Baba, she also came forward to encourage and support me when, in spite of all my insecurities, I decided it was time to share my experience with the outside world. She then began to direct and selflessly involve herself with the writing, publishing, and distribution of the book. “This book will have a far-reaching effect on many,” she said,” and above all it will be of the heart, for that is the seat that belongs to Meher Baba, whose love graces us all. 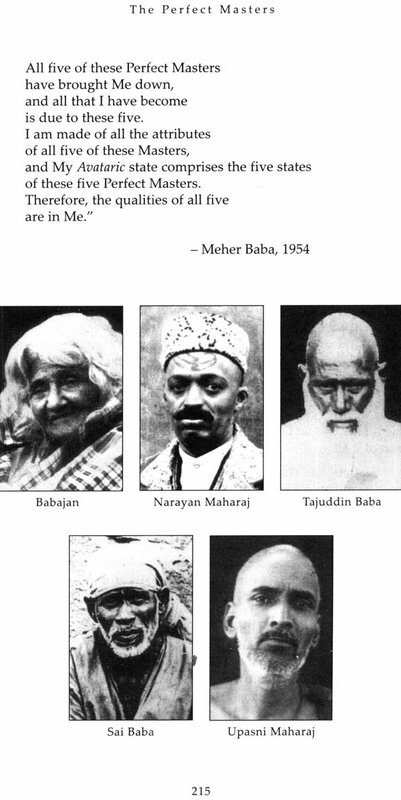 As for our children, belongs to Meher Baba, whose love graces us all. 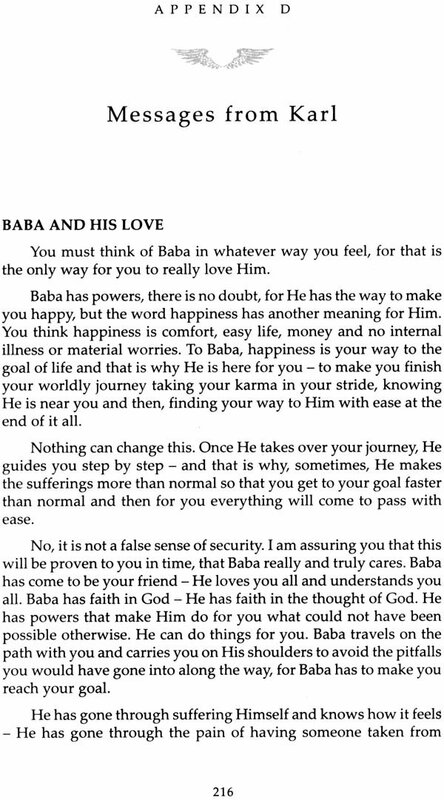 As for our children, they too belong in our hearts and therefore to Baba-and that is enough for me.” I must admit at this point that while my stubborn focus of attention was Karl and his stories, it was Amie who steered me throughout and towards the conclusion of the book, where not only had I to acknowledge that my love for Meher Baba was absolute, but that He was and it God to me. 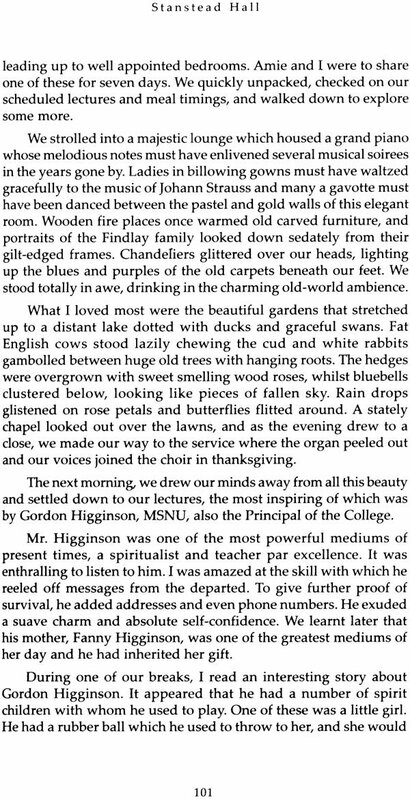 Sounds of Silence was published in December 1996-and the first copies went out into the world. In spite of reassurances from friends and family, I was nervous about its reception. Would anyone listen? Would they believe? But I really needn’t have worried so much. The book took on a life of its own and touched the hearts of many people. Its appeal seemed to lie in the fact that it was not only a true story of a young boy who had been well-known in India, but it was also about the love of a mother and son –about a love that never dies. It was something new, something different. The book reached out to thousands of people and interest seemed to rise by the day. Reviews and write-ups appeared in local newspapers and international magazines. Ladies’ Clubs and the Rotary Club organized meeting and seminars to discuss its contents. Could all this really happen? Could it be true? 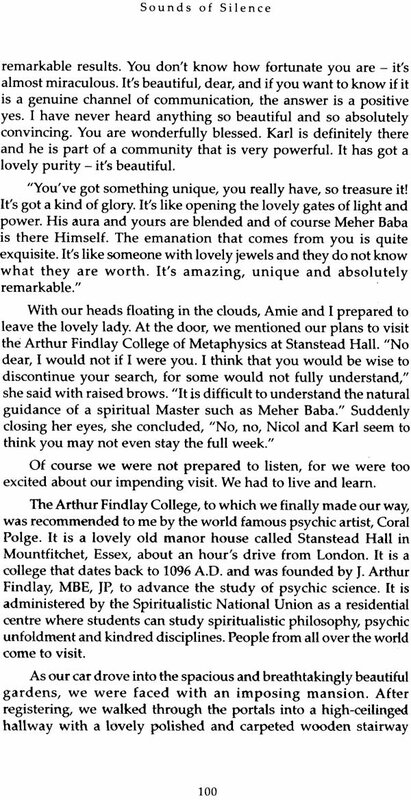 Slowly but surely, the interest crept from social gatherings into homes, where people began discussing the incredible incidents that had taken place, sharing the beautiful messages that came through Karl from the spirit world, and marveling at the help that some of them had received from his Master, Meher Baba. 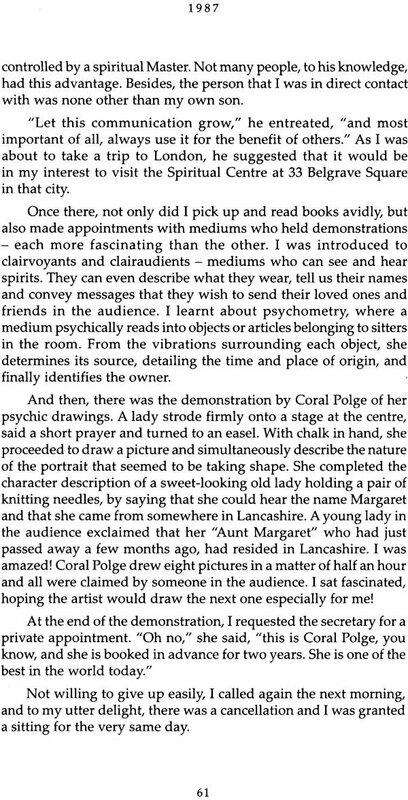 It progressed into people wanting to know more about the Master. So it has gone on. The response has been overwhelming-the reactions spontaneous and heart-warming. “I am not afraid of death any more,” or” …I keep it by my bedside for it makes me feel loved and protected” or “Whenever I am in trouble, I just open a page and I get my answers,” were some of the comments I received from people who read the book. 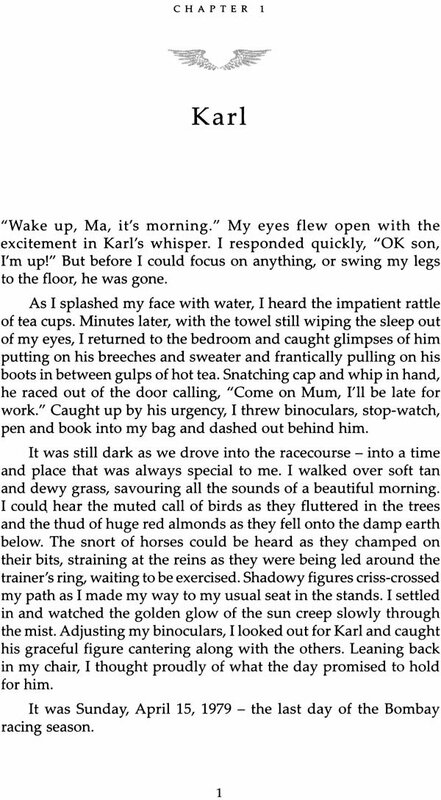 Through its pages, Karl, in his own inimitable way, has encouraged people to make their own connections with the Avatar and to look at life from a new perspective. 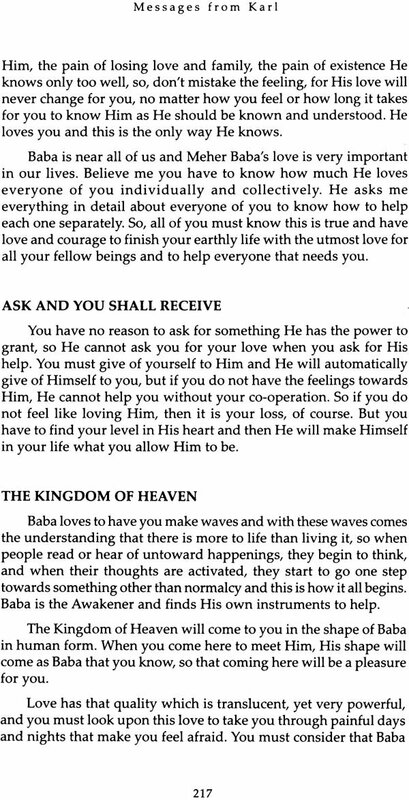 With Baba’s help, many hearts have been healed. Those who were bereaved came to know that their loved ones are not lost forever. Broken relationships have been cemented and new ones formed. People have been shown how to let go of pain and suffering, and find inner peace. Many lives have undergone a change for the better. It has now been nine years since Sounds of Silence was first published. Yet the interest in the book appears to keep on growing. The time has now come for it to still go further-to reach out to a world that has evolved to a new awareness- a world that is in search of peace, happiness, and a spiritual love that is timeless.